Editor's Note: This post originally misstated that you can't reply to a Google Places review of a business. We have updated the story. Google has been very apologetic about the fact that open businesses are being incorrectly reported as closed on Google Places. It's incredibly easy to report business as closed on the service, and Google has promised on its blog to fix the problem. Let's back things up for a second and look at the Google Places service. Google Places is free, and you can't argue with that. It also puts your listing at the top of local searches for your business category, since the first thing that pops up when you Google health food store" + "New York City is a map displaying pertinent businesses. Having a listing on Google Places ensures that you are on that map and gives you chances to enhance it through adding videos, brands that you carry, QR codes, and additional information about your company. Your customers are definitely using Google Places. Google's Marissa Meyer stated earlier this year that 20 percent of Internet searches were local, while 40 percent of mobile searches were local. Additionally, customers with smartphones are using Google Places to find your business with the Google Places app for both Android and iPhone. BlackBerry and Windows Phone users can access Google Places listings through Google Maps for Mobile. You also have the option of using QR codes in your listing, which give mobile users even more information about your business. Once you are on the service, you can see exactly who is visiting your Places profile via Google Maps Mobile, as well as those visiting through a regular Web search. You can even see where driving directions requests originated from, which can tell you if you need to target online or offline ads in a specific neighborhood. The process is not hard or time-intensive. Simply enter your information at places.google.com to register with the service. If you already have videos on YouTube and a QR code, be prepared to enter those to enhance your listing. If you have a highly competitive business category, take advantage of these extra features to get a leg up on your competitors. The problem that users have been reporting for a couple of months is that when a business is reported as closed, a tag comes up right away that reads, "Reported as closed." A business that I know closed permanently at its current location this past Sunday, so I reported it today as being closed. It still received the "reported to be closed" tag within half an hour of my report, although it did not happen instantly. But if your open business was one of those that was reported as closed on Google Places, simply click, "Reported to be closed. Not true?" next to the name and report it as being open. As with any other online presence, it's a good idea to build in reminders to check on your Google Places account once every few months or so just to make sure your information is up to date. 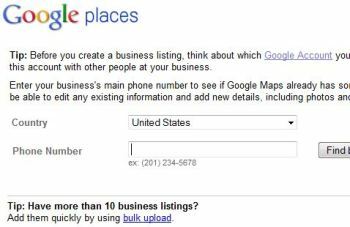 Unfortunately, it is harder to change your address on Google Places than for someone to report a business as closed. My attempt to report a changed address today for my own business generated a postcard that will take two weeks to mail to me, and my address will change on Google Places only after I receive the postcard and enter the PIN number on it. Should it be harder to change your address than to report a business as closed? It would seem that a similar procedure could be followed using email rather than mail to confirm that a business is closed before any tags are generated. 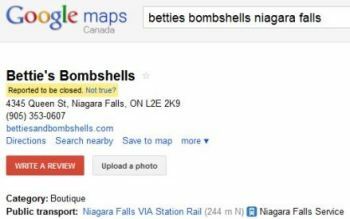 Another malicious practice that a competitor can engage in, besides prematurely closing your business, is to give your business a negative review on Google Places. Places used to be an excellent consolidator of most other review sites, including urbanspoon.com and traveladvisor.com, until Google announced over a month ago that they would only be displaying Google Places reviews. This was in response to Yelp and other review sites complaining about their content being used on Google Places. A non-savvy competitor may create an account just to give your business a bad reputation. If you truly believe a fake review is being placed on your Places entry just to trash your business, you can click on "Flag as Inappropriate" below the review to dispute it. Google will investigate, but whether the review remains up is entirely at their discretion. A review from a truly disgruntled customer is another matter. Replying to a review is the best option. You can do this by logging into your account and choosing to reply to the review as the business owner. If you aren't on Google Places yet, don't let the recent negative news deter you. Google has promised to sort out the issue of businesses being reported incorrectly as closed, and they tend to be good about keeping their word once a problem has been revealed with their services. With so many Internet searches being centered around localized results, you can't afford not to be listed on Google Places.